Washington (AP) — In a rough-and-tumble, foul-filled game, Bradley Beal took over in the fourth quarter with 16 of his 31 points, including a key late 3-pointer, helping the Washington Wizards beat the Atlanta Hawks 109-101 on Wednesday night for a 2-0 lead in their Eastern Conference first-round series. John Wall finished with 32 points and nine assists, including the dish to Beal for his shot from beyond the arc with 38 seconds remaining that sealed the win for the hosts. Washington, which trailed 78-74 entering the final period, won despite only a combined seven points from starting forwards Markieff Morris and Otto Porter Jr., who were both in foul trouble early. The series now shifts to Atlanta for Game 3 on Saturday. 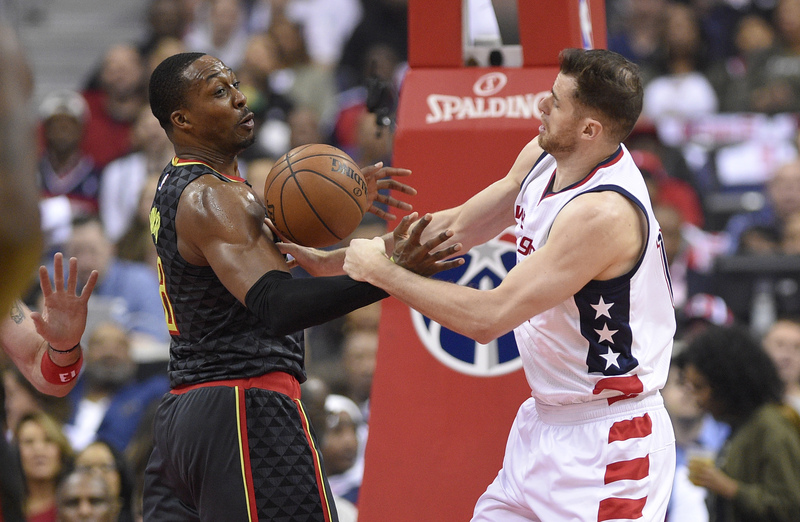 Millsap scored 14 points in the third quarter, including six during a 13-0 run by the Hawks that took them from a deficit to a 74-67 edge with a little more than 3½ minutes left in that period. But Beal and Wall were too much in the fourth, with some help from backup point guard Brandon Jennings, who accounted for eight consecutive Wizards points during one stretch — making three baskets and assisting on another. That became a talking point during the off days, and perhaps affected the way Game 2 was called. It was hardly akin to a mixed martial arts bout, but the officials sure seemed determined to use their whistles upon seeing anything resembling a foul. Whatever debate might be had about how justified all the calls were, one thing was clear: All of those interruptions disrupted the flow of the game. Washington led 51-43 at halftime. More noteworthy: There were 29 personal fouls in the opening 24 minutes, 55 for the game. There was plenty of complaining by the Wizards throughout, and when sixth man Kelly Oubre Jr. got No. 4 and joined Morris and Porter on the sideline, the team was whistled for a delay-of-game foul, its second, resulting in a technical. About 30 seconds later, Howard picked up his fourth foul, while Kent Bazemore was at four entering the last quarter, too. When another couple of calls went against Washington in the third quarter, many voices in the sellout crowd of 20,356 rose in unison for full-throated chants of derision directed at the officials.